NewscastStudio regularly gives a bird’s eye view of various broadcast sets, but never before have we taken a look at how the role of the fabricator fits into the world of the designer. 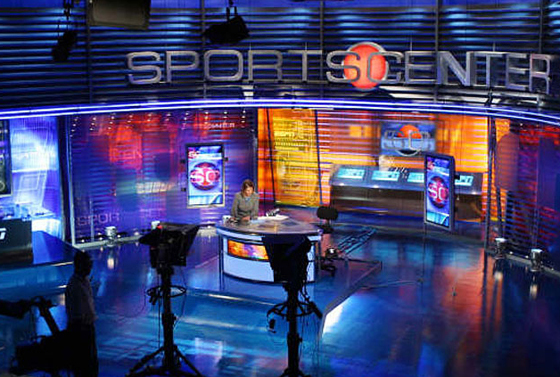 This exclusive series goes behind the scenes of ESPN’s latest set and shows you how Jack Morton PDG and Lexington Design + Fabrication work together to create innovative sets. 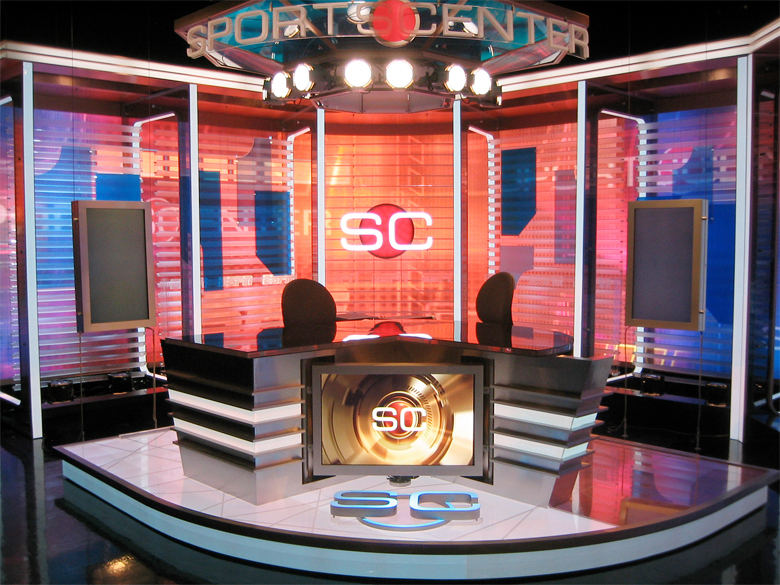 This is the first of a three-part series with both the designer and the fabricator of ESPN’s new SportsCenter Los Angeles set, which was built for ESPN’s recently opened West Coast Broadcast Center located at L.A. Live, across the street from the Staples Center in downtown Los Angeles. 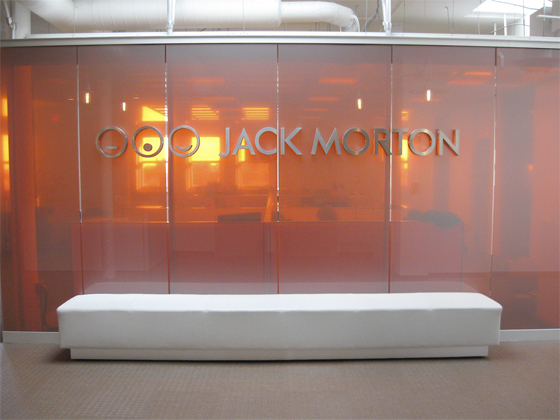 Andre Durette is VP/Senior Design Director at Jack Morton PDG in New York City, an award-winning broadcast environment design firm that is part of Jack Morton Worldwide, the global experiential marketing agency. Jack Morton PDG is the firm behind many of the sets for ESPN for which they used Lexington Design + Fabrication. Ron Hubbard is the general manager and vice president of Production at Lexington Design + Fabrication, an award-winning Los Angeles-based design-build firm for themed environments. NewscastStudio: Thank you for taking the time out for us. I understand you two have worked together for some time. Andre Durette: Yes, about seven years. I was designing the sets for two new shows, and I needed a fabricator who was a master of detail. Not an easy find. A friend suggested Lexington because of their reputation for ultra-detailed museum work. Ron Hubbard: And now we’ve fabricated eight of the ESPN sets that Jack Morton PDG has designed. NS: That is quite impressive. Andre, at what stage do you involve your fabricator? After you finalize your designs? AD: No, much earlier than that. The fabricator helps me envision my design at the bidding stage. NS: That early? At the bidding stage? AD: Yes, actually fabricators like Lexington go to great lengths to do this. 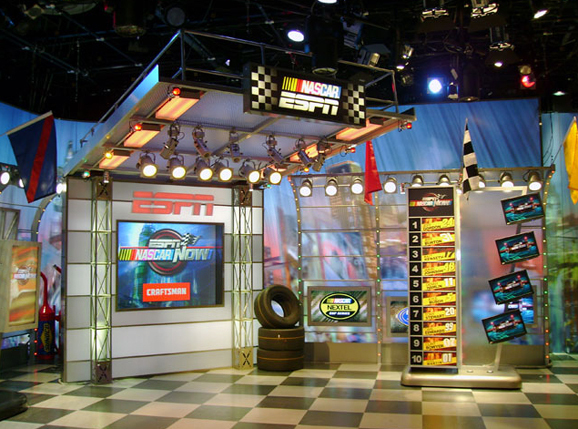 ESPN needs to see bids from three different fabricators for each project. So it’s part of the competitive process. NS: Ron, that means even though Lexington had done this eight times for Jack Morton PDG before, you would still have to pull out the stops to prove yourself again? RH: Yes, but we look at it through a different lens than that. We see it as an opportunity to help Jack Morton PDG convey their design intent to their client — in this case ESPN — and show them that we continue to understand their needs. When you’re given an opportunity to work again for a world-class design firm like this, and it’s been such a great experience the past eight times, you’re happy to do the entire bidding process again for the ninth. NS: And what’s involved in the bidding? RH: Well first, Andre gives us his concept sketches and floor plans, and all the specs for his original design intent and vision. Lexington does a cost proposal for that. If the cost proposal exceeds the project budget, then we do a value engineering process on it. NS: Can you clarify what you mean by “value engineering”? RH: It’s our technique for estimating the value of each set component by examining its function. Value is the ratio of function to cost. AD: Which really helps, because I’m a designer, not an engineer. The V.E. gives us a picture of how much of our dream set we can accomplish, and where we can cut some elements from the project if we have to, not only keeping to the budget but maintaining our original intent. NS: How does HD play into your design and fabrication decisions? AD: We always design with the assumption that every detail will be in focus in HD. As the details become more apparent, the decisions behind the designs are getting more complex. NS: In what ways are they getting more complex? AD: HD has opened up so many more possibilities for what the viewers see, so our broadcast clients always want us to come up with new, exciting ways to help tell their stories. Especially when it comes to sports, since it’s a mix of news and entertainment. And some sets have more space for us to design. Because the cameras don’t just stay tight on the anchors, they’re moving all over the sets — wide shots, high angles — to enhance the viewer experience. NS: And Ron, how does HD affect what you do to ensure quality construction? RH: Actually, Lexington doesn’t do anything different for HD, because even before HD, we had always put museum level details into everything we did. Lexington’s roots are in museum design and fabrication. 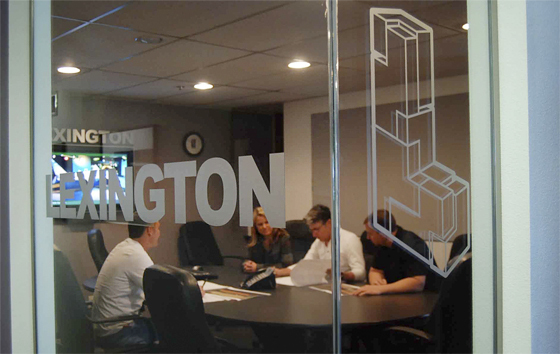 But, as far as ensuring quality, Lexington is a little different from most fabricators — since our workshop is all under one roof, it enables us to have a triple-quality control process. Our project technical director, our director of production and myself – each of us check every step on every project. .
NS: I understand there aren’t many turnkey fabrication shops like yours around anymore. AD: There are really only a few. RH: Yes, and we think it enables us to be more proactive fabricators for the entire process. NS: Explain more about what you mean by that. Lexington Design + Fabrication staff at work. RH: Well, since we have 180 full time skilled craftsmen and engineers, we have a resource pool to draw from to ask, “What else can we do to add to the longevity of this set?” “How can we protect it from the effects of the UV lights?” Questions like that. We don’t want to deliver a pretty set, and then a monitor goes out at 2:00 am, giving the ESPN engineering department a mound of headaches. AD: And we’re glad they ask those questions. As I mentioned, as a designer I am always thinking up innovative new ways to engage the audience. But we continually need to do tests on those innovations, to see what is really going to stand up on camera. Lexington is great about doing tests with us, to get it right. NS: Can you give us an example of a test you two did together that produced something innovative that we see on an ESPN set now? AD: Yes. First let me explain, we have two kinds of set lighting — the stage lighting, which I work on with a designated lighting designer, and the LED lighting embedded in the furnishings and walls, which I work on with the fabricator. So here’s an example. Our clients love the color amber (as seen in many of the pictures on this post). But the typical RGB color scheme will make just one shade of amber. So we said, “Let’s see if we can get different shades of amber in the LED lighting.” We came up with a lot of different ideas and we kept testing them. And we ended up creating many shades of amber in the LED. 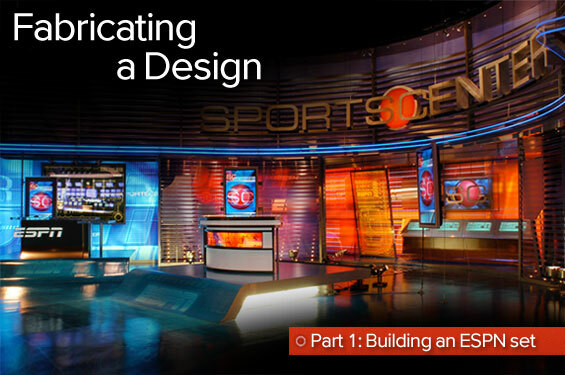 Part two in our series Fabricating a Design covers “Designing the Newest ESPN Set.” Also stay tuned to learn more about the secret behind the amber lighting used at ESPN.